Before there was an Mi-2, there was an Mi-1. 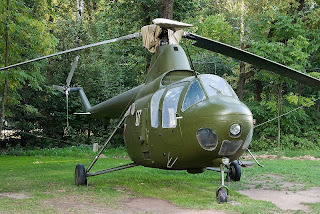 After a first flight in 1948, the GM-1, designed by the Mil OKB, won a state competition to become the first operational helicopter in Soviet Military service. Publicly displayed for the first time in 1951 while U.S. helicopters were first being featured in newsreels during the Korean conflict, the Mi-1 was given the code name "Hare" by NATO. The Mi-1 carried a pilot and three passengers and was powered by a seven-cylinder air-cooled radial Ivchenko AI-26V piston engine, providing 575 HP. 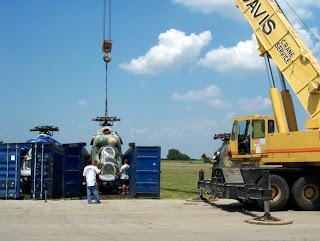 The engine and transmission were located in the main fuselage, where the extended crew and cargo area of the Mi-2 (NATO code name "Hoplite") is found. An estimated total of 1,800 Mi-1s were built in the USSR up to 1955, when production was transferred to the PZL factory at Swidnik in Poland. 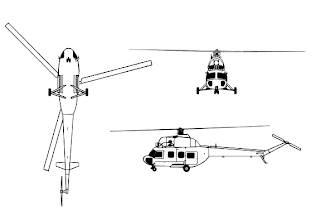 The factory, which later began production of the Mi-2 and larger helicopters is now known as PZL-Swidnik and still manufactures helicopters used in other countries throughout the world. 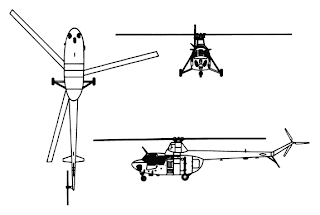 The instruments of the Mi-1 reflect simpler times and systems. While there are differences, the two Mil's share a design heritage. After some hydraulic system work and strut tweaking, Mike and Bruce took Mi-2 Bord 211 around the patch. Without ever leaving Texas, you can visit London, Paris, Rome and Moscow. With a rich culture originating in many different countries, there are towns with worldly names all over our fair state. So it should not be too surprising to find a contingent of Soviet, Cold War aircraft here as well. The students at Mildred High School, from Mildred, Texas, recently finished studying about the Cold War and their teachers brought them to see and hear about some of the artifacts of the Cold War. One of the pleasures of volunteering at the Cold War Air Museum is having the opportunity to talk with well behaved young men and women who are the future of our country. Tracie and Phil took one group under their "wing" for a walk-about and talk-about through the museum. One of the students seems to be taking a picture of Phil in the photo above. 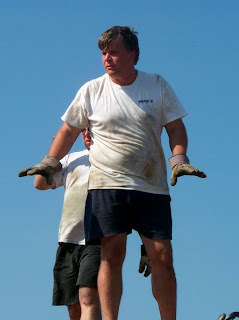 While Phil in fact qualifies as a genuine Cold War artifact, we generally refer to him as our volunteer coordinator. Phil also coordinates the community service credit hours for our student volunteers. Museums use the fancy word "docent", to describe a "knowledgeable tour guide". While Phil and Tracie both certainly qualify as docents, we generally don't use such fancy language here and simply refer to the many pilots and students of history involved with the museum as our "Associates". Bud took the other group. Dividing the 60 plus students into two groups made it easier to talk with individuals and encourage questions. This group got a look at the T28 associated with our sister museum while moving between our buildings. The students toured both Hanger One, primarily used for display and Hanger Three, primarily used for restoration. Hopefully there may be some future aviators (pilots) in the class. These young men are getting a look inside the cockpit of a Mach-2, mig-23 fighter. Both groups asked many good questions. The girls were less shy about asking questions than the guys. Tracie, a Commercial Pilot and Helicopter Instructor, assured them not only that she flew as much as the guys, but that women make excellent pilots and have career opportunities in aviation. We enjoyed a special moment of fun with several of the students trying on hats from our collection of Soviet gear. They even convinced one of their teachers to pose with them. On behalf of the museum, we hope they enjoyed their visit and that it was beneficial for the students, teachers and the school. Bord 41, an L29c still carries its original markings from Bulgaria. The Unit and ID markings on these working aircraft stored outside were well faded. These original markings are being replaced and renewed by one of our museum associates. The training command to which this aircraft belonged used an Eagle painted on the nose to designate their aircraft. Abel has taken on the task of renewing these markings, including the Eagles on both sides of the nose. Although we obtained the original template from the base when we acquired their parts inventory, it is too worn to give a sharp rendition. Here he is making sketches to compare to the template and aircraft before deciding how to proceed. After making his sketches, Abel cut a new template for evaluation and made a test image on a piece of plastic sheeting. The final template and harder surface of the aircraft will yield a sharper image. Memorial day is a National Holiday honoring and remembering those who have died in military service. The Cold War Air Museum joins with families and communities all over America in recognizing and honoring our men and women in military service and those who have paid the ultimate sacrifice. My friend Bernd, who ran an East German L-39 squadron, is an adviser to the museum although I'd never met him in person. He has an amazing knowledge of L-39s and also stocks parts — which makes him a great resource when you've got a Plane Problem — but his great sense of humor and gracious nature makes him the sort of guy you feel lucky to know under any circumstances. For several years I'd been threatening to come to the music festival held at the beginning of May in Bautzen, Germany near where he lives. One can only threaten for so long before one has to make good on the threats or drop the ruse. So we packed our bags at the end of April and headed East. Way East. East Germany East. "Almost Poland" East. 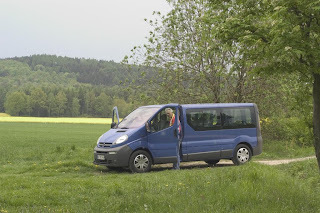 For three days Bernd took us around in his Blue Opel Wonder Van and showed us the sights. It was a truly memorable trip... we took over 500 photos! 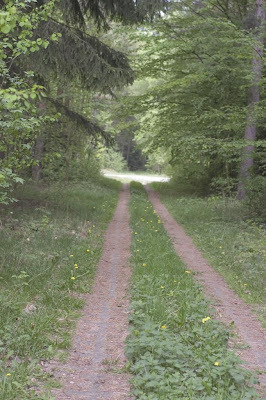 One of the days, as we were going along, Bernd said, "There's something I'd like to show you." We were near the Taucher Forest, near Uhyst am Taucher. 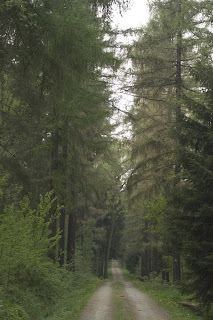 Eventually we got to some concrete tracks that lead away from the main trail in the woods. "I think it's up here," he said. The tracks were made from a kind of reinforced concrete, the kind that would support heavy equipment. We followed them deeper into the woods. And there it was. A massive bunker, one of 16 that had held SS-22 IRBM nuclear missiles. The missiles had been installed in response to the Pershing II and cruise missile deployment by NATO in West Germany. 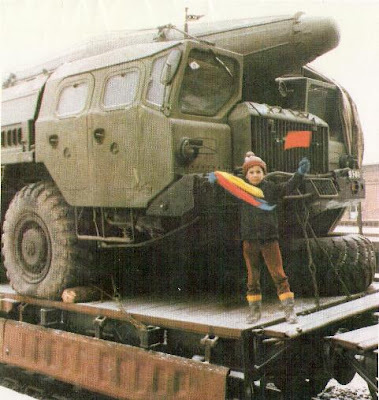 The missiles were removed in 1988 as part of the Intermediate-Range Nuclear Forces Treaty. Since the treaty only covered the destruction of the launchers, the Pershing II missiles and about 100 nuclear warheads are still with NATO in Germany. 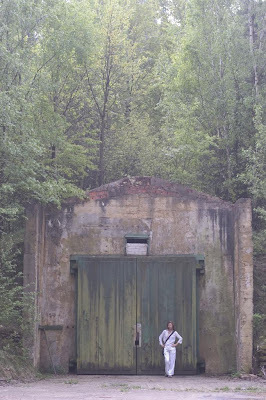 In order to launch the missiles, the trucks would drive out of the bunkers to one of the launch pads, basically clear circles in the woods, and tilt the missiles skywards. This could be done very quickly. Every year a group meets at the site to commemorate the removal of the missiles and pray that we never get so close to blowing each other to Kingdom Come ever again. 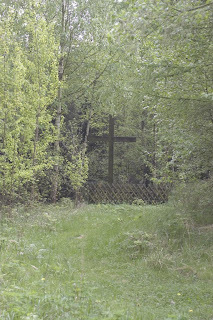 A small cross marks the spot where they meet. Answer: Pick up the box, tilt and pour, shake gently as necessary. Repeat until done. One of the problems with successful shipment is constructing good fixtures and securing them in the container so parts don't shift and get damaged. 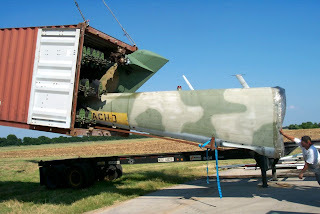 The tails and rotor blades were packed tightly into two standard containers. Unloading these containers was a challenge and some damage occurred in shipment. With all the ingredients out of the box, we could finally begin to "bake the cake". Putting the ships up on their gear made them portable. Bord 122 looks on sadly as her sister passes by. A temporary ramp allowed the helicopters to move inside the newly completed building. Congratulations are exchanged as the sister ships, Bords 118 and 120, find their new home. 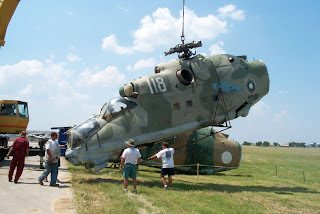 How do you get an Mi-24 from eastern Europe to Texas? Answer: you take it apart, put in a box and ship it. 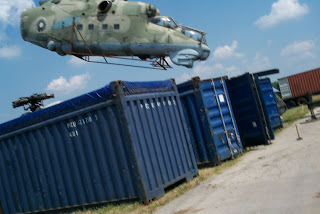 This picture shows the relative size of the Mi-24 when loaded into a standard shipping container (hi-top, open-top). It also shows a how "not". This is the container that was Not transported correctly and subsequently damaged Bord 122. Loaded on a standard trailer instead of a low boy trailer, the masthead hit the first bridge along the otherwise carefully planned route. 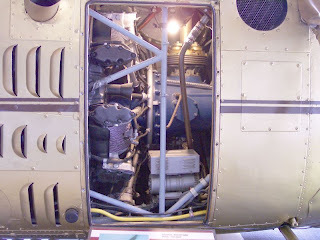 The impact sheared the transmission mounts and laid the rotor head and transmission over onto the engines. Even the frame of the aircraft was buckled by the impact, rendering the aircraft a total loss. Acquiring the aircraft is only one step in a multi-step process of bringing the aircraft to life at the museum. The "Backstory" label below will be expanded to include stories of how many of our aircraft got here and how they were reassembled or restored. We are getting our Finnish Fouga ready to fly more often. Shown here when it first moved to the museum in '07, it is still one of the most asked about aircraft because of it unique V-tail design. Jon is one of our all-around generalists, he can fly-em and he can fix-em. Recently he tackled the task of replacing the on-board batteries. Originally equipped with finicky (and expensive) Ni-Cads, we recently found it was time to replace the batteries once again. Here, Jon is installing our favorite replacement, an "Odyssey" battery set. With roots in the Hawker Siddeley group, Odyssey manufactures batteries used in demanding commercial applications. As anyone who has dealt with the "system" can tell you, it takes additional time and money for a product to receive Mil-spec or FAA-PMA approval. In the best of all possible worlds, "COTS" or "Commercial Off The Shelf" technology can be one or two generations ahead of governmental procurement. Fortunately for us, this is one of those times that we can take advantage of a well developed commercial technology. Perched on the Fouga, working in the battery compartment, Jon looks ready to imitate Major Kong in the 1964 classic cold war movie "Dr. Strangelove". From "Dr Strangelove" - courtesy of YouTube, with dialogue for our German friends. The director of this movie made heavy use of comedy and irony. 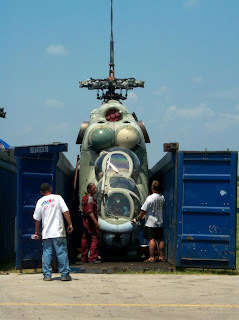 Bord 122, the Mi-24 that was damaged in transit, is being restored as a static display and is the subject of the "Gate Guardian" series of stories on our Blog. In one of the later posts in the series, this view, reminded me of a Star Wars Movie Imperial Walker (AT-AT Walkers) and made me wonder if life was imitating art, or art was imitating life. 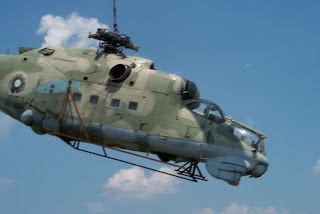 What really bothered me next though, was realizing that the first Star Wars movie predated the deployment of the Mi-24 "D" model. Perhaps someone over there studied our movies and said "AhHa"!, this time we are really going to get the jump on those Capitalist's. Abel is one of our volunteers who is a craftsman with paint. Here he is meticulously removing the old paint to restore an L-29, Bord 41 to its original military colors. The tip of the nose has been redone and the old anti-glare paint in front of the cockpit has been removed and a new layer applied. Next will come numbering and restoration of the eagle on the side of the nose. In places we estimate there were as many as seven layers of old paint to be removed. 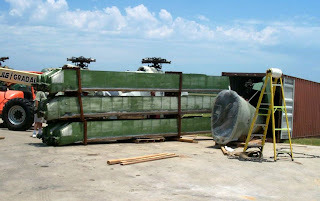 The outer nose and outer tips of the wings are fiberglass and have already been replaced. 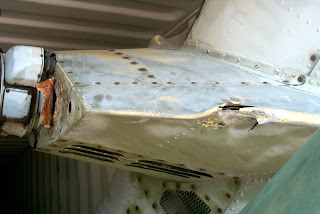 Here the outboard sections of the wing are shown in a before and after montage with the layers of removed paint shown between. 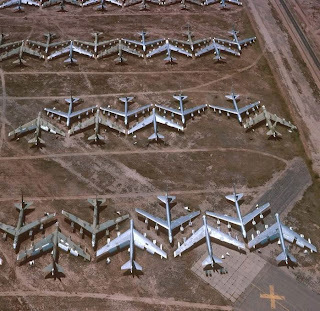 (and not sent to a museum), They are stored in the "Bone Yard" near Davis Monthan Air Force Base in Tucson, Arizona. More than 4,000 aircraft are maintained there by the 309th AMARG. 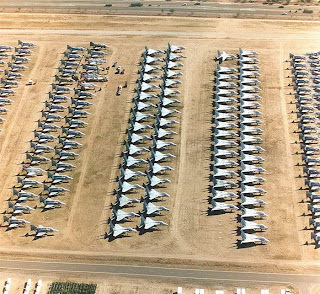 The climate conditions at Davis Monthan, combined with preservation of the aircraft allow many of these aircraft (in theory at least), or scarce parts from them to be returned to active service if necessary. It is quite a sight to see. Even the precision in the way they are parked is impressive. 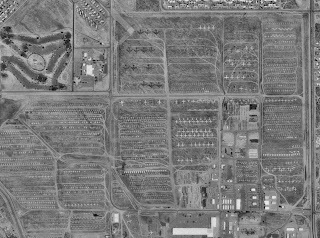 It's difficult from pictures alone to comprehend the size of the 'Bone yard' and the number of aircraft stored there. Two of the aircraft in this picture parked side by side or nose to tail would be wider or longer than a football field (>100m). If you are ever near Tucson, tours are available through the Pima Air Museum, located near the Base. The museum and the bone yard are popular attractions. 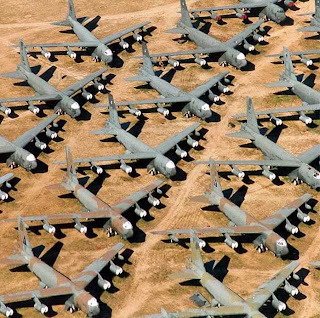 It is difficult to comprehend the number of military aircraft in storage. Even if you have seen these photographs before, it is worth looking again. The 3rd largest Air Force in the world is sitting on the ground here. 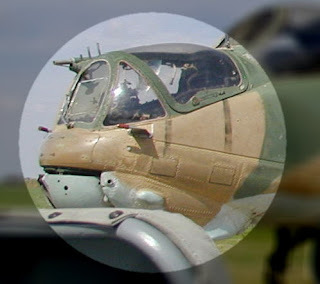 An "unofficial" AMARC web site provides additional pictures and details on many of the aircraft that have been stored here (AMARC was the former name of the maintenance group). Unfortunately, some of the pictures listed on their site may no longer be available. When aircraft are no longer useful in the inventory they are demolished and sold for scrap.